At the dawn of the motor industry, the roads were plagues by frequent accidents. Soon, it was clear that there had to be some way to identify vehicles. This led to the birth of the Motor Car Act of 1903 which was quickly followed by the issuance of the first number plates. The first number plate was issued to Earl Russell and was simply marked A1 in simple bold font. Since then, the registration of motor vehicles has changed a total of 4 times, all in an attempt to accommodate the growing number of vehicles on British roads. The first plates to be issue lacked a number to denote the year of issue. This dateless system lasted for 60 years. The first plates were made up if the local council identifier code of up to 3 letters followed by numbers. By the early 50s the numbers were running out and as such the format was reversed (the random numbers coming before the local council code). In the 1920s the Roads Act was passed, making minor changed to the system. Until then, it had been common practice for authorities to have two registers; one for cars and another for motorcycles. This made it possible for a car and motorcycle to have the same number plate. At the time, when a car moved from one area to another, it would lose its number plate and receive another. This system proved too inconvenient. In August 1983, the prefix system was introduced. This letter indicating the year was moved to the beginning of the plate thereby doubling the lifespan of the number plate system. The last two letters referred to the area code where the plate was registered and the three numbers and the first of the three letters were only meant to provide a variation for identification. This system didn’t use the letters I, O, U and Z and the letter Q was only used when the age or the origin of the vehicle could not be determined. It took 20 years to exhaust the prefix system’s lifespan and a new system was required towards the end of the 90s. 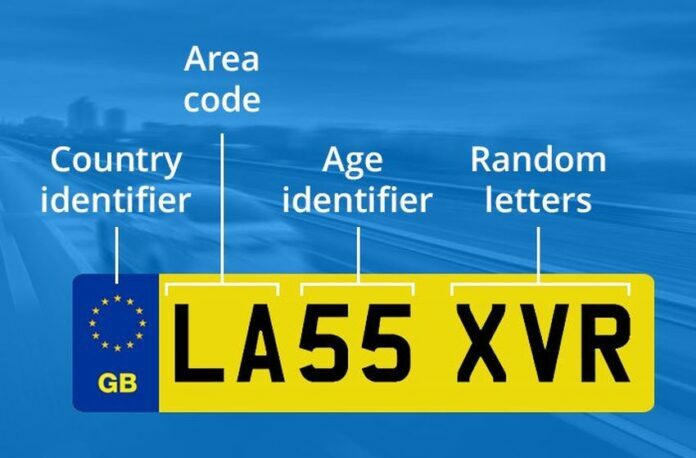 The current style we have to day came about when police realized that most people will remember the letters of a registration number more than the numbers in case of an accident. As a result the current system is made up of three parts. Two letters denote the local region the vehicle was first registered. There is also the date ID which indicates the date of the registration of the vehicle and changes every 6 months, in March and September. The last 3 letters are random and can now include Z. The current system is more future-proof than the other system and has the capability to register 12.6 million new registrations each year. It is expected to run smoothly until 2049 at which point it can be easily reversed.